CTS-V Wagon Update: Do I Regret Buying An Automatic? I think it’s time we addressed this topic. By “we,” of course I mean “I,” who will write today’s column with little or no input from you. And by “this topic,” of course I mean how I purchased today’s coolest car with today’s uncoolest transmission. It’s the automotive equivalent of moving to New York City, growing a beard, wearing flannel, riding a fixed-gear bike… and living in Queens. 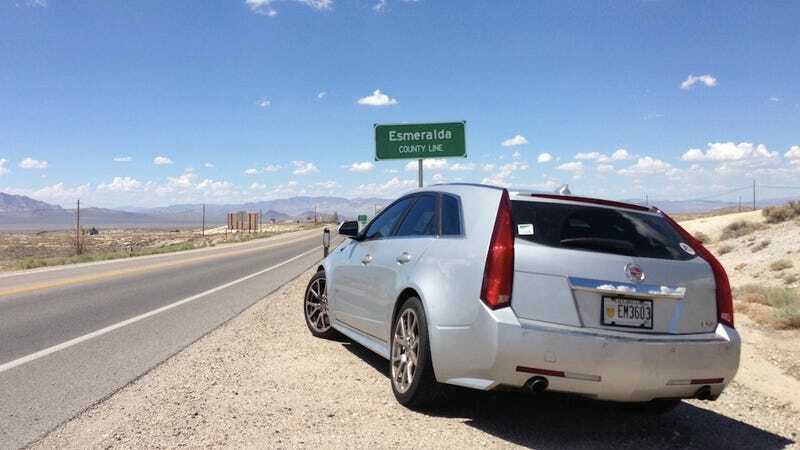 For those of you who don’t know, the car I’m referring to is my Cadillac CTS-V Wagon, which boasts 556 horsepower, rear-wheel drive, a navigation system, and taillights that could double as a Wal-Mart regional distribution center. I’m not sure how you couldn’t know at this point, since I write about it all the time, much to the dismay of Jalopnik staff, Gawker Media, and Internet users in general, all of whom say things like: Doug DeMuro… isn’t he the guy with that automatic Cadillac? Well, yes, he is, and he’s damn pleased with it. That’s right, ladies and gentlemen. The Cadillac has an automatic. It could’ve had a sweet six-speed stick with a fuzzy gear lever that I could swap out for one of those skull shift knobs. But it doesn’t, and I’m completely OK with that. 1. We already know the stick shift is good. I’m not sure if you’re aware of this, but every single publication in automotive history has reviewed the stick shift Cadillac CTS-V Wagon. You may think I’m exaggerating, but I’m not. Seriously: go to your local library, pick out a microfilmed 1913 copy of “Horseless Carriage Today” and you will find – sandwiched between articles titled 1914 Duryea To Offer Leather-Wrapped Direction Changing Stick! and Acura Says NSX Replacement Due Next Year – a story where they review the stick shift CTS-V Wagon. If you want to know how the manual is, I suggest checking out Motor Trend, Car & Driver, Automobile, Road & Track, Autoweek, Autoblog, Edmunds, Business Insider, CNET, The Wall Street Journal, The Truth About Cars, The New York Times, Left Lane News, Motor Week, Wired, The Smoking Tire, cars.com, and even Jalopnik, all of whom tested it and said something to the effect of: THIS IS THE MOST AMAZING CAR EVER TO BE DRIVEN SOLELY BY GM EMPLOYEES! 2. Really, there weren’t any for sale. When I wanted to buy a vehicle for the noble, selfless purpose of writing about it (also known as the noble, selfless purpose of taking a large tax deduction), a few of you recommended the CTS-V Wagon. So I went searching. I quickly discovered that, of the 20-odd for sale across the country, not one was a stick shift. Plus, the cheapest one in America was less than 15 miles from my doorstep. I took that as a sign. 3. The automatic is actually pretty good. So reasons one and two apply to my particular situation. I wanted to review an automatic to provide a different perspective. And I couldn’t find any manuals for sale. But what about you, dear reader? Maybe you’re considering a CTS-V. Maybe you commute. Maybe you already have a “fun” vehicle with a stick. Maybe your wife drives the car, and you tried to teach her stick once but she fried the clutch in your ‘86 Fiero. Is the automatic an acceptable choice for you? You see, the interesting thing about the CTS-V’s automatic is that it’s actually pretty good. Now, for those of you who are used to driving manuals, you might not think it takes much work to make a good automatic. You push the gas, it downshifts. You cruise on the highway, it sits in top gear. How hard is that? The answer is that’s actually really hard. This is proven by the old Cayenne V6, which used a 6-speed noise transmission that produced, instead of acceleration, a loud ruckus. And let’s not forget my Range Rover Classic, which made such a loud bang upon being placed in reverse that it was like the car was asking: Do we really have to go backwards AGAIN? The V’s transmission, on the other hand, is excellent. Normal mode shifting is exceptionally smooth. In sport mode, it’s a little rougher – but the benefit here is that the car downshifts so quickly you barely have time to tell your passenger about the lease deal you’re getting as a GM employee. And the manual mode is great, in that it shifts when you tell it to and always lets you know precisely what gear you’re in. Maybe my only complaint is that Cadillac chose to skip shift paddles, which everyone knows and loves, in favor of what can only be described as computer keys from a mid-1990s desktop PC. I have yet to discover an explanation for this. So there are really two messages to take away from this. Number one, the V Wagon is still just as V Wagonny with the automatic transmission. It’s still fast. It still looks great. And it still handles like a sports car. Yes, the manual is great – but I’d happily recommend either transmission in an instant. And number two? I’m tired of driving an automatic. The next car will be a stick.